Power-over-Ethernet (PoE) is a network standard based on IEEE 802.3af that provides a means of delivering power to devices connected to the LAN. This technology eliminates AC electrical wiring, wall transformers, allows centralized UPS backup, and is fully compatible with both powered and non-powered Ethernet devices. In addition to providing time synchronization and control over Ethernet, PoE enabled Ethernet cable provides power to the clock. System installers need run only a single Ethernet cable that carries both power and data to each clock. 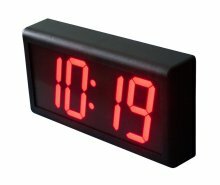 This allows greater flexibility placing clocks and, in most cases, significantly decreases installation costs. Galleon clocks are fully compliant with the IEEE 802.3af standard for providing power over Ethernet. The clocks will work with older non-standard and passive power sources, as well as newer, auto-sensing PoE switches and mid-span power injectors. The displayed time can be synchronised to a NTP Time Server, ensuring accurate time. 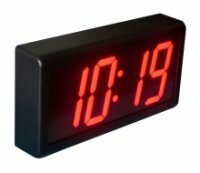 Clocks can be used where acurate synchronised time to a national time standard is required. Power-over-Ethernet begins with a Ethernet power source such as a PoE compatible Switch or a mid-span power "Injector". These devices insert power onto the Ethernet cable. The power source is typically installed in the "wiring closet" near the Ethernet switch or hub. If the access point is not PoE compatible, Galleon offers single port mid-span power injectors designed to provide power to a single clock (P14 power option). Multiport mid-span PoE power injectors are available from most network equipment vendors. The voltage injected is 48 volts DC at 0.35 Amps.